This entry was posted on June 24, 2009 by Andy. A quick Q & A session with Phil Jackson, Managing Director of Feature Radiators. Q: I am looking for cast iron radiators for my Victorian property but don't know whether to go for reproduction models or reclaimed. What would you suggest? A: There are pros and cons for buying both reproduction and reclaimed cast iron radiators. I have set out below the main points to be aware of. § should be tested to European standard EN442 (this provides assurance that the product has passed rigorous testing and is deemed fit for purpose. EN442 is also verification that the heat outputs stated are accurate). i. you can specify the right size radiator for your room, in terms of both heat output and dimensions. ii. you can easily obtain matching radiators in the correct sizes for use throughout the house (achieving this using reclaimed radiators would need a lot of good luck and patience). § are the easier choice - radiators arrive on site (in primer or painted finish), ready to plumb in. § can be picked up at low cost - but be aware of the extra costs (money and time) involved in renovating and transporting. § can be found in interesting and unique designs and can have a history (it is worth checking the recent history in particular; make sure reclaimed radiators have come off a working system and be sure they’ve been stored indoors to avoid frost damage). § do not usually come with a manufacturer’s guarantee. Warning – do not power coat cast iron radiators, reclaimed or reproduction, as the process can damage the seals between radiator sections. 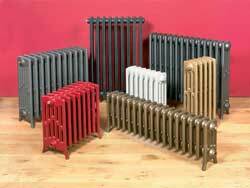 More information can be found about radiators in all shapes and sizes at www.featureradiators.co.uk. Nice post!! One of the most popular options is the cast iron radiators of old. With their simple designs and beautiful curves, cast iron radiators offer efficiency and elegance in any home design. Using a radiator to heat the rooms in your home was efficient because it didn't create drafts. Relying upon hot water going through the radiator, the heat in each room could be controlled more effectively by controlling the amount of hot water that each radiator received.